A beautiful anthology of colonial historical vignettes in the same vein as Matt Dembicki's collections. In fact, Dembicki has illustrated a story in this collection. I'm actually only familiar with a couple of the authors or illustrators but I found the stories and art top-notch. 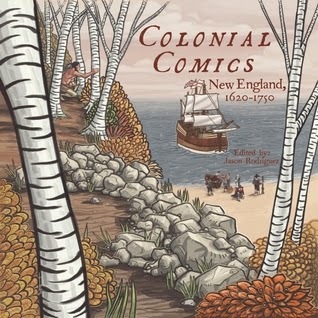 This chronological history of New England tells the lesser known tales and I had not heard many of them, even though they are populated with famous people. Because the stories are chronological, geographically specific and focused on a set time period, often characters will reappear in several stories, sometimes as a major player, other times as a background figure. The book is best suited for middle graders to high school and the book's website is making educator guides for the stories. However, the material is perfectly satisfying to the adult reader and the art is varied and showcases a variety of styles. I found it quite impressive and highly readable.